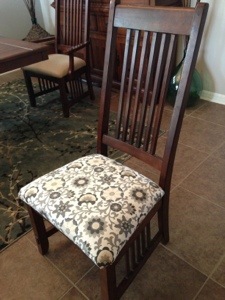 One of the DIY projects I’ve been excited to do for a while was update the fabric on the chairs in our dining room. Now that I have the gorgeous grey on the walls, the brown had to go. I’ve looked for fabric for months, with desire never meeting budget. 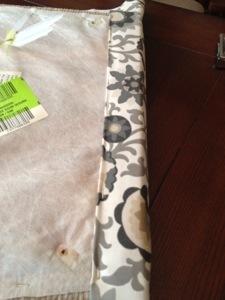 Then someone told me about fabric.com, and I was overwhelmed with affordable options. And I loved that I could order swatches before committing. Eight swatches later, I found the combination of grey and fun I was looking for. 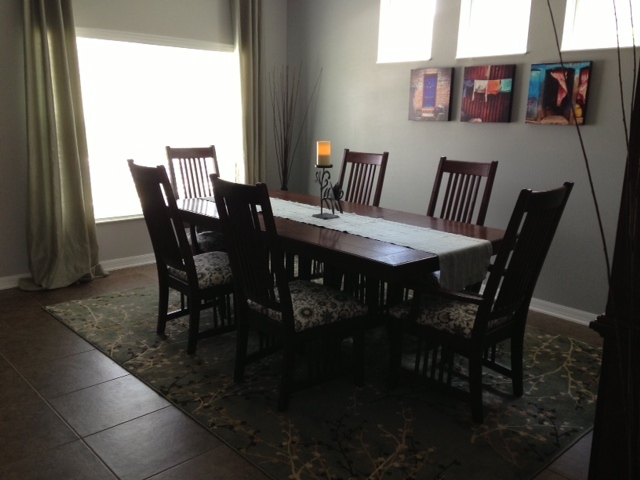 This is the before shot–the tan fabric that came on the chairs eight years ago. 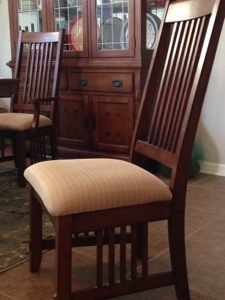 If you’ve never recovered chairs before, it’s so incredibly easy! And so deeply gratifying. 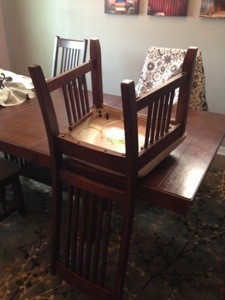 First, you turn the chair upside down and find the screws keep the seat connected to the chair. 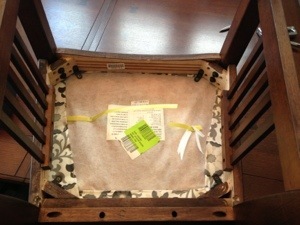 After finding said screws, you take them out and remove the cushion from the base, leaving a seatless chair. 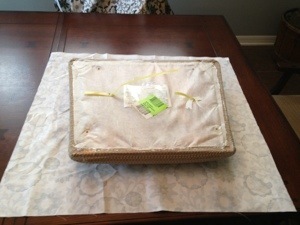 I cut a piece of fabric the size of the seat plus six inches (i.e. 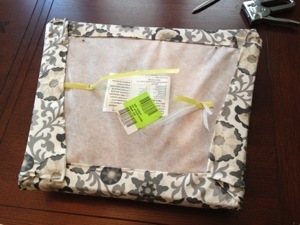 the cushion was 30-inches wide, so I cut the fabric 36-inches wide to allow for folding and stapling). 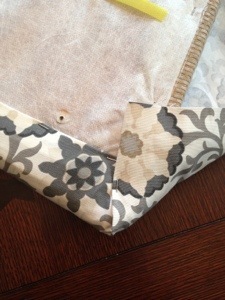 Fold the fabric under a little and staple one side down. The staple the opposite side, pulling the fabric very taut as you staple. 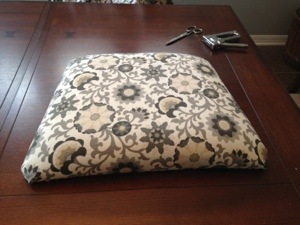 The corners were a little challenging on these cushions, since they aren’t perfect squares. But I worked with the fabric until I liked the looked and stapled as I went. And that’s it for the cushion. It was that simple. 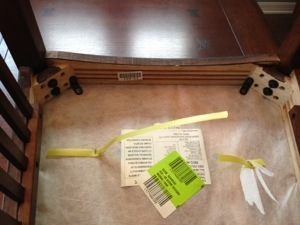 Then you turn the cushion back over, line up the screws, and put it back together. Viola! Isn’t it cute?! Total time commitment. 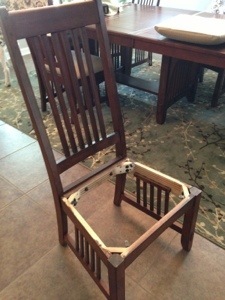 . . maybe 20 minutes per chair. I love how the whole set turned out. Simple, low cost and fast. What more could you ask for?